Winged bean grows as a vine with climbing stems, up to 3-4 m in height. It is a herbaceous perennial, but can be grown as an annual. Leaves are compound with 3 leaflets. The leaflets are more or less triangular, tapering to an acute point, about 3-6 in long and almost as wide at the widest point. The large flowers are pale blue, but vary in color in cultivars. 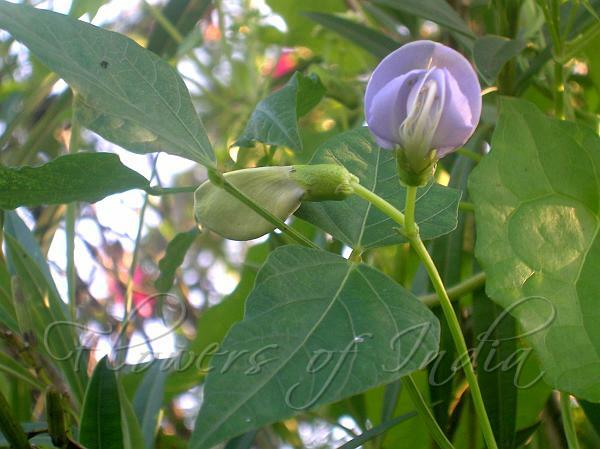 They are larger than green bean flowers, a little more than 1 inch long, and hang in loose clusters of 2-10 flowers. 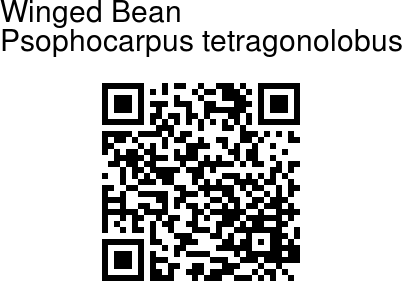 The bean pod is easy to identify - it is typically 6-9 inches long and has four wings with frilly edges running lengthwise. The skin is waxy and the flesh partially translucent in the young pods. When the pod is fully ripe, it turns an ash-brown color and splits open to release the seeds. The beans themselves are similar to soybeans in both use and nutritional content. The fruits are used as a vegetable but the other parts (leaves, flowers and tuberous roots) are also edible. The young shoots and leaves may be eaten raw or cooked as vegetables. Winged bean is probably native to Papua New Guinea, and is commonly clutivated and eaten in NE India.